Auger Cadet Seoulou is a polytechnic specialist in mobile, web and multimedia technologies. Since 2009, expert of the National Bureau of Technical and Development Study (BNETD) seconded to the Ministry of the Ivory Coast Of justice in that Head of the department web and multimedia. The department of which he is responsible within the Ministry of Justice of Côte d'Ivoire has the task of accompanying step by step the ministry in its process of digital transformation. 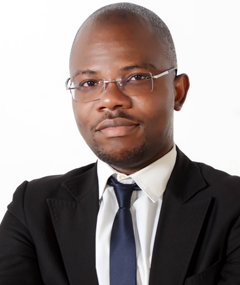 It should also be noted that since 2015, he is co-founder of the Ivorian startup HADWIGER who is represented in Côte d'Ivoire in Abidjan and France in Lyon. Startup specialized in mobile technologies and connected objects. Finally, he is the vice-president of the Club DSI of Côte d'Ivoire. Ministry of Justice and Human Rights: Government institution whose mission is to ensure the fairness of the exercise of justice over the entire population but also to ensure the defense and protection of human rights. Avis d'expert : "L'e-réputation, risque ou opportunité pour l'entreprise"